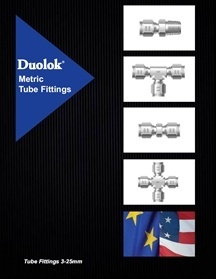 Duolok metric tube fittings are designed and manufactured to provide a reliable, leak-proof connection in instrumentation and process tubing systems. Duolok metric tube fittings use a double ferrule design, which, with the staged sequential swaging action of the ferrules during make-up, compensates for the variations in tubing materials, hardness, and thickness of the tube wall to provide leak-tight connections. Click on the catalog below to download the full version.